Great looks, great clamping, long life and no squeaking. The Thomson Seatpost Collar has several features that make it distinct. 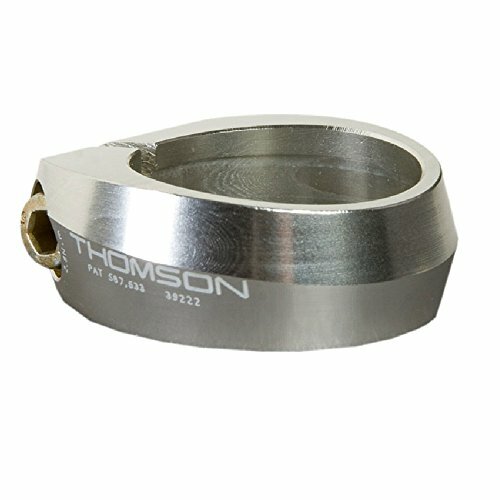 The collar utilizes the Thomson Seatpost bolt, washer and barrel nut combination that has proven strong over the years. This fastener combination allows float on both sides of the collar slot ensuring consistent clamping force. The bolt hole angle, height of the collar and offset slot all help create a collar that generates maximum clamping force at only 25 inch pounds of fastener torque. The Thomson Seatpost Collar is made from the same 7000 series alloy as their seatposts and stems giving you the high performance and long life you expect from a Thomson. The perfect addition to your Thomson Cockpit. 100% American made.